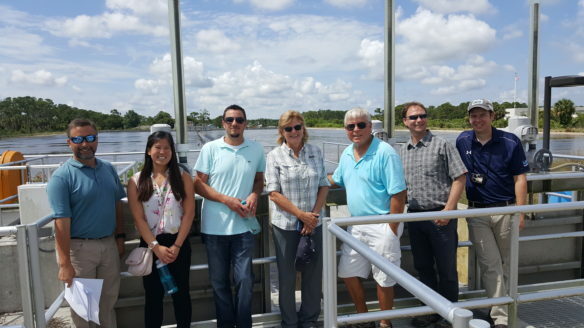 Vero Beach, Florida (June 28, 2018) – A representative of the Maryland Department of Transportation Maryland Port Administration and engineers from Anchor QEA and NMP Engineering toured the Egret Marsh Algal Turf Scrubber® and Osprey Marsh Algal Turf Scrubber® (ATS™) systems to gain a better understanding of the ATS™ technology at utility scale. The Maryland Port is currently completing pilot testing and development of a design for a utility scale algal floway system to reduce nutrient loads in the Chesapeake Watershed. The tour was conducted by HydroMentia and Indian River County staff. The toured facilities illustrate how the technology can be applied at utility scale to achieve nutrient reduction and water quality enhancement. The Egret Marsh ATS™ – operated by the Indian River County Stormwater Utility group is designed to reduce nitrogen and phosphorus levels from agricultural and urban stormwater runoff. The Osprey Marsh ATS™ – managed by the Indian River County Utility Department is unique in that it operates as an industrial facility, providing water quality enhancement and nutrient reduction for a blend of urban and agricultural runoff as well as the treatment of reject water from the adjacent reverse osmosis drinking water production facility. Indian River County’s visionary approach to water treatment has allowed application and enhancement of the ATS™ technology to provide a cost effective solution to meet the county’s goals. HydroMentia Technologies, LLC designs innovative, cost-effective, managed aquatic plant treatment systems for pollution control and water restoration in agricultural, industrial and urban applications. The Algal Turf Scrubber® is a proprietary technology available exclusively through HydroMentia Technologies, LLC. HydroMentia owns numerous patents and intellectual property. Its head office is in Ocala, Florida. For more information about HydroMentia Technologies, LLC go to www.hydromentia.com.